New-construction condo building featuring three luxurious units. 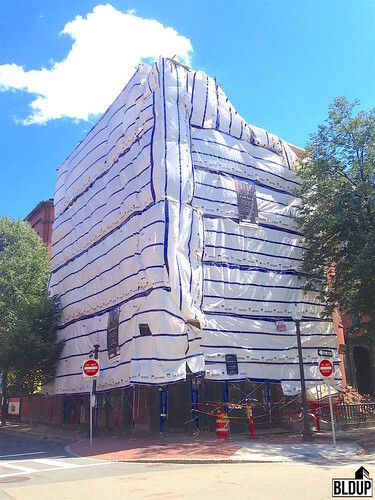 An existing four-story historic brick building has been restored, and a contemporary four-story addition has been built to the existing building's rear. Condos include two duplex units and one extra-large floor-through unit. 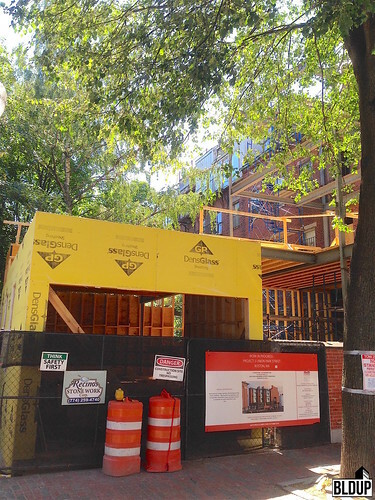 Framing of Union Park Condos' four-story addition along Union Park Street is underway. 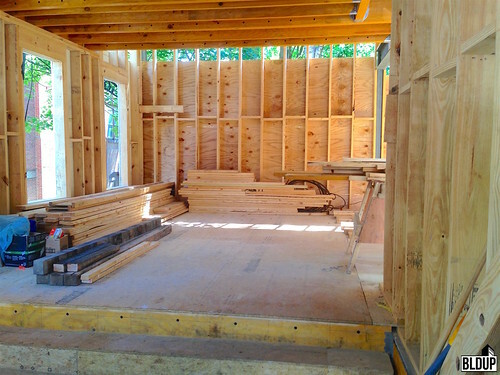 The future private entry of 5 Union Park Street, a duplex unit, has been fully framed with wood. Moisture and mold-resistant sheathing (yellow) is being installed along the entry's wood frame. 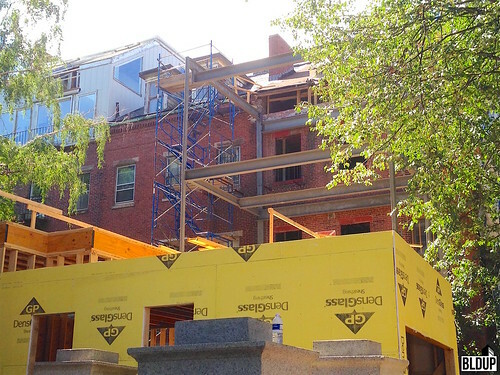 Steel framing for the full four-story addition has risen three stories along the existing building. 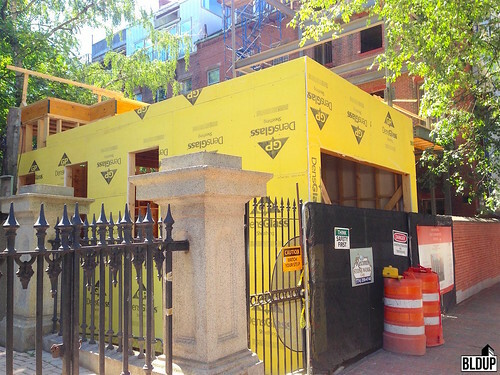 The steel frame will soon extend towards 5 Union Park Street's wood-framed entry. Wood framing of first and second-floor walls has also begun. 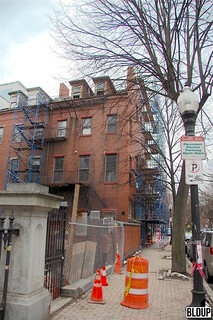 The existing building fronting Shawmut Avenue will be restored as part of Union Park Condos. The existing building is covered with flame retardant to protect the construction site from fire. A total of three luxury units are being offered at Union Park Condos. Two units will be duplexes, and one will be an extra-large floor-through. All three units will feature open floor plans and top-quality finishes located in the heart of the South End fronting beautiful Union Park. More sales information, as well as floor plans and spec sheets, is available at UnionParkCondos.com. A project rendering is posted above. More information about Union Park Condos is posted below. 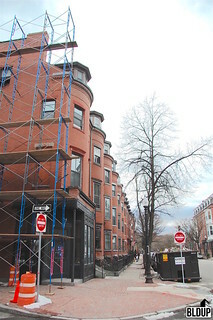 Project general contractor Boston Property Contractors has installed scaffolding and construction fencing at Union Park Condos in preparation for commencement of construction. An excavator has been parked in the backyard to begin work on the project's rear addition. 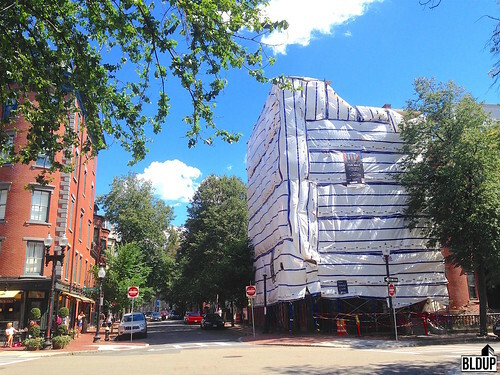 BP Union Park LLC, a limited liability company (LLC) affiliated with local real estate developer Boston Property Development, today acquired 316 Shawmut Avenue, a four-story building in Boston's South End, for $4 million. 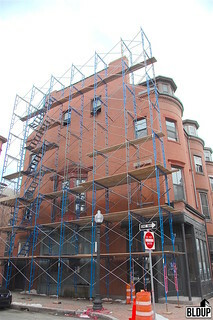 316 Shawmut Avenue's seller is 316 Shawmut LLC, an LLC affiliated with local real estate developer TCR Development. 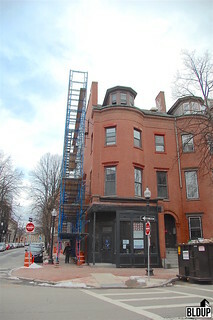 316 Shawmut LLC acquired the building in September 2014 for $1,949,500 and guided an unbuilt addition to 316 Shawmut Avenue designed by EMBARC Studio through the City of Boston's approvals process. More information about the approved addition is available on EMBARC Studio's website. An architectural rendering of the approved addition is posted above.